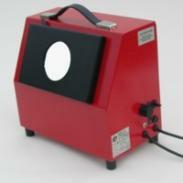 The distinctive, red KOWOLUX viewers are to be seen in X-ray laboratories and on construction sites all over the world. They conform to European Union Low Voltage and EMC Directives 73/23/CEE and 89/336/CEE and their performance is in accordance with EN 25580. In order to maximise the intensity of light available for examining very dark areas, the KOWOLUX 7 is the only model in the range where uniformity of luminance is disclaimed. To download a PDF product brochure for the Kowolux 7 click HERE.